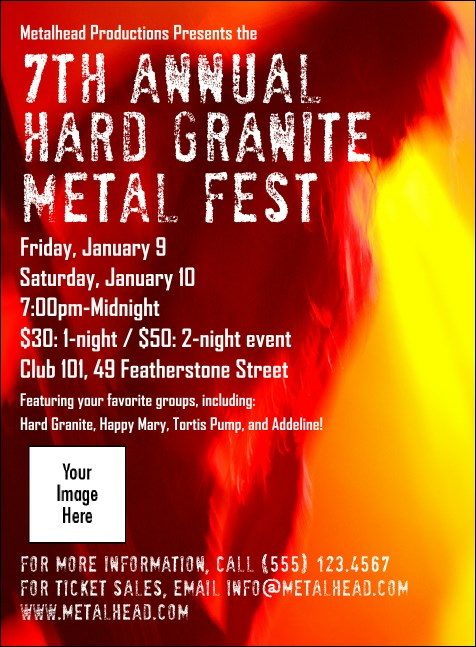 Invite your friends and VIPs to the headbanging concert of the year with a Heavy Metal Invitation from TicketPrinting.com! Featuring a vivid red and yellow background with the silhouette of a guitarist, this Invitation template is sure to have guests playing air guitar all night long. With TicketPrinting.com’s easy 15 minute customization process, you can be back to rocking in no time! Part of our Event Kits , this Invitation has matching promotional materials on TicketPrinting.com. Rock to the beat of your next hit song with an Event Kit that will have fans moshing all night!